The route starts on the north end of Burlington, WA, You take I-5 exit 231 for Chuckanut Drive (also known as WA Route 11). From there just continue straight on Chuckanut Drive for the rest of the way to the end point in Fairhaven, WA, which is a neighborhood in the city of Bellingham! Quality of the road is good, but watch for rock slides and cars that cut the corners. This trip has a lot of diversity and something for everyone. It starts out with lots of flat, straight road, however when you get onto the mountain, it has lots of twists, just like any good canyon road. Note: It is tempting to open the throttle when in the flat lands of this road, but beware, a state patrol station is right at the intersection of this road, and I-5. And while I have never seen troopers run a speed trap on this road, just be aware that they are in the area. .
Stop at the Japanese garden at the base of the mountain (just before the twisties begin), or stop at any one of the restaurants along the way for some fantastic seafood. Larrabee State Park is nice, with camping, picnic benches, and a beach. The park can fill up fast, so plan ahead. At the end of the road, you'll be in Fairhaven, which is a neighborhood in Bellingham. Lots of good shopping and eating there. on April 14, 2012 1 out of 1 members found this review useful. Amazing views, excellent turns, and on a skinny road. It's short and has quite a bit of traffic, but manageable if you don't mind passing on any straightaway. Long commute for a short road. I always take this route when visiting family in Sammish Bay. It's a bit short, but has lots of twisties to enjoy. 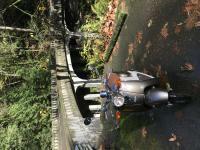 The last time I rode this on my way south from Bellingham, I stopped for a wonderful meal at Chuckanut Manor. on September 3, 2009 0 out of 0 members found this review useful. This is a great road, but gets very crowded on the weekends. Frankly a bit too short also. Lots of others to do nearby. Go in April or May to see the Bald Eagles and Tulips.